To build on our concept of unifying all services at a user level we have introduced an updated Devices tab. This will now list all of the user’s devices and allow them to be configured, such as changing the button functions, codec, display etc and the updated config file generated – all within the same tab. This avoids having to go into Device Pool the users Shared Call Appearance to configure all the user’s devices. We have also introduced a new report Reseller report “Assigned Device Summary” under Reports > MIS. 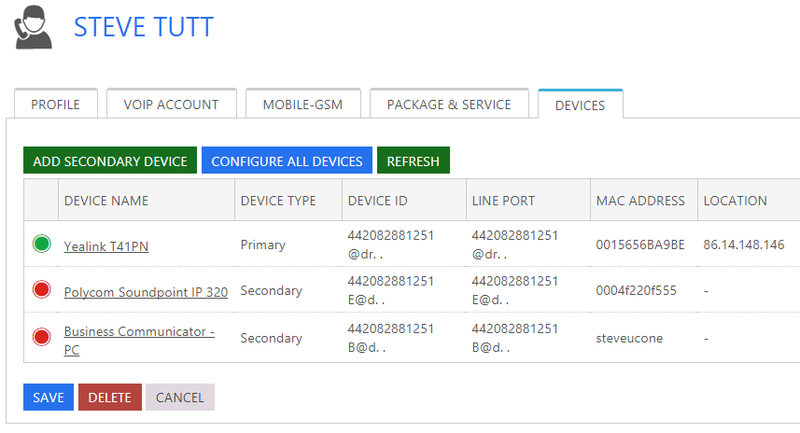 This will show all device types in use and a count of the number deployed. Clicking any device will drill-in to display every business, site and user with the device and they dated it was connected.